Black cats out of zuccini skin and a pumpkin heart as a top decoration of the fruit display made for the 1st birthday of a young girl. This is my 'Cute Halloween Greeting' to all my readers and friends! Автор: Unknown на Wednesday, October 31, 2012 , Ссылки на это сообщение , 3 коммент. 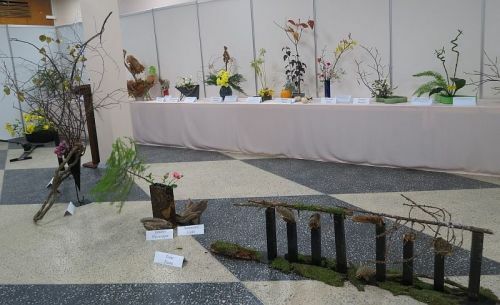 We are having Ikebana Sogetsu week here in my hometown. Six teachers from Sogetsu Branch in Sapporo came to Sakhalin to exhibit thier arrangements and teach. Being a student of Sakhalin Sogetsu school I set up my Ikebana arrangement with vegetables (Morimono). 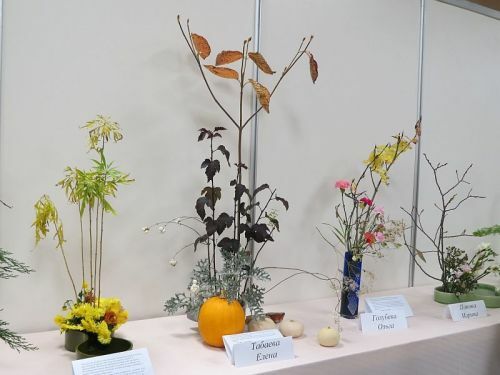 Usually Ikebana arrangements have no names. It lets people to think thier own meaning. The main point of Ikebana is beauty of natural materials (flowers, leaves, branches). 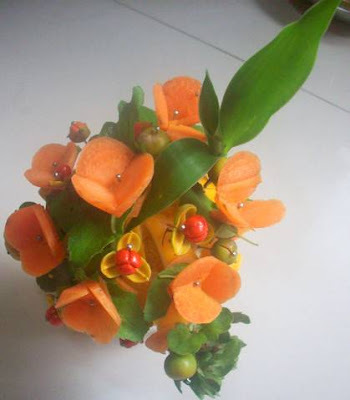 Sogetsu is a free styled Ikebana art. This time I used whole pumpkins with no carving elements. Once done, a master of Ikebana cares for his arangement till the last day of the materials live. You have to refresh and rearrange the components to extend the beauty of the Ikebana. The forth day of the exhibition. Rearranged by my teacher. Learning Ikebana art helps me to see beauty in the simple things. I use some Ikebana principles for making my carving arrangements. I also hope that the Carving Contest's participants will take advantage of the Ikebana rule and will care for thier voting results till the last day of the Contest poll. Автор: Unknown на Monday, October 29, 2012 , Ссылки на это сообщение , 3 коммент. I recieved messages about the Contest Poll fault, that does not count votes. Indeed, the Google Poll service works incorrectly. It sounds like a Halloween nightmare! I have changed the poll service and restarted the Contest Poll. I am sorry if you voted, but your vote didn't count. Please visit the page back and vote again. The Contest Poll is prolonged to November 10, 2012. I am so sorry for the mess. Hope you understand, and the situation didn't hurt you. Автор: Unknown на Saturday, October 27, 2012 , Ссылки на это сообщение , 3 коммент. The Online Carving Contest Stage 2 is on air. Find the Contest entries below and use the side bar poll to vote for your favorite carving work. Invite your friends to support the participants by voting for them. Please UPDATE THE PAGE after voting to SEE THE RESULTS. The poll ends on November 10, 2012. The 3rd place – A set of carving books. Besides the top prizes, there are special awards from TempleofThai.com. 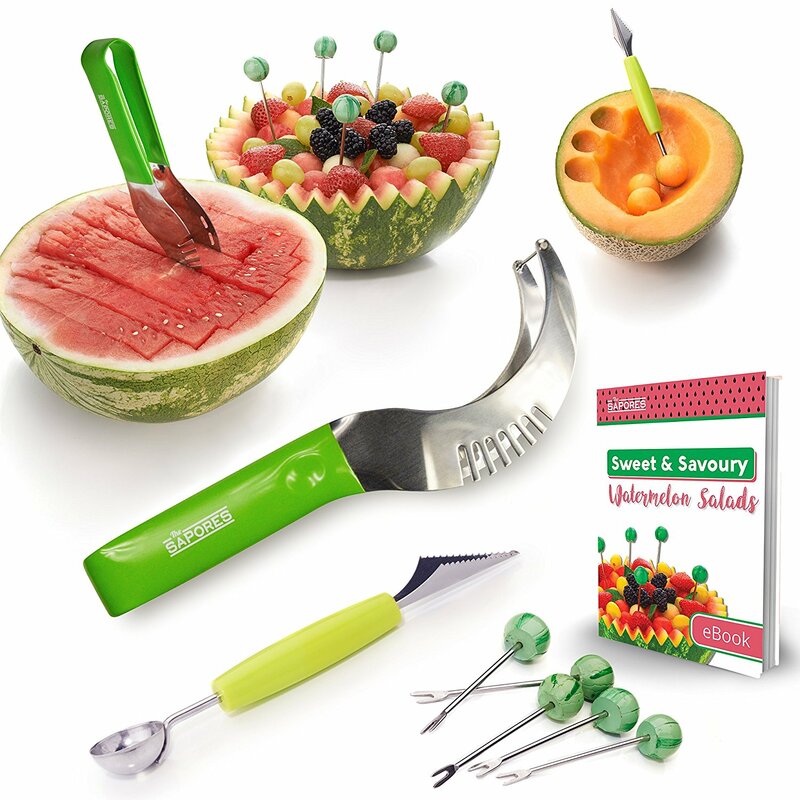 Temple of Thai is an online shop for Thai food, Asian kitchenware and fruit carving books, tools and DVDs since 1999. They accept different payment methods and ship worldwide from their location in Los Angeles, California, USA. To determine the special award winners I asked for a help of a special man SamSam Bubbleman! Sam is a British artist making a Grand Soap Bubble Show in London, UK. Sam performs Bubble Shows at private parties, weddings, kids party, science show and corporate events. He does the show for television, films, videos and celebrities. Samsam Bubbleman has bubbled the Olympics 2012 in London. Q.: Sam, I know that you do Bubble shows at the different events which are weddings, corporate, birthday and kid's parties. 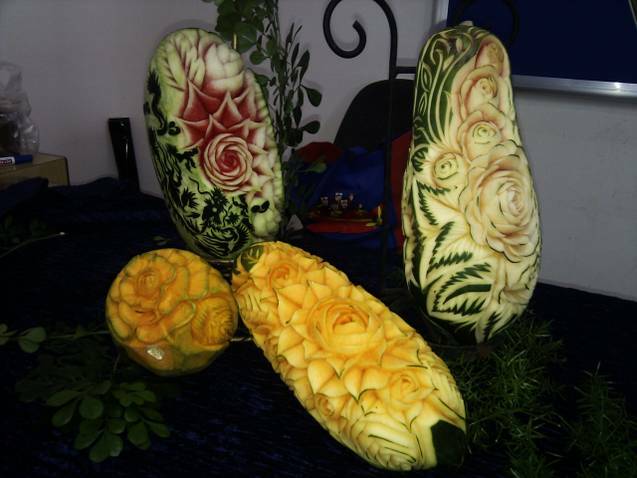 Have you seen fruit carving displays at the events? What they were like? 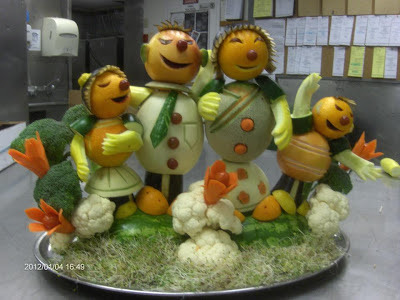 A.: I don't remember seeing fruit carvings at any events, although I remember reading about a performance made by some musicians who made their instruments out of fruit and vegetables (like a flute carrot! ), played a concert, and at the end of the concert, the musicians would cook their vegetables into a soup and all the audience could eat it! I didn't get a chance to see it, but it sounded like a remarkable performance! 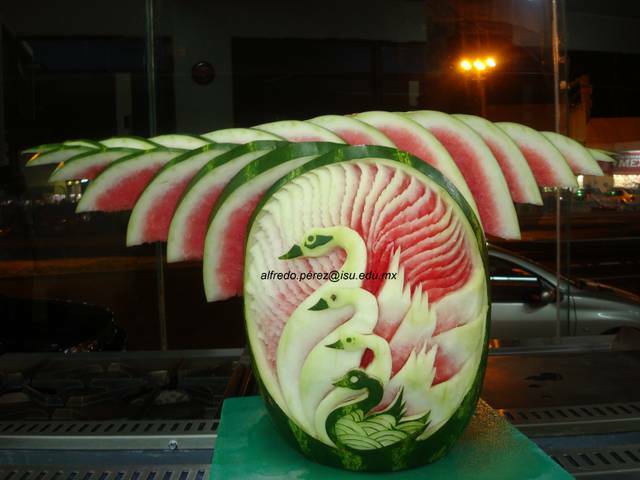 Q.: I wonder if there fruit carvings were displayed at the Olympics 2012 events? A.: The Olympics were everywhere! There were celebrations and events organised all over the country. We were involved in a couple of these - one was to do with the Olympic Torch, and the other was the Opening Ceremony itself. Regrettably I saw no fruit or vegetable carving at either of these. 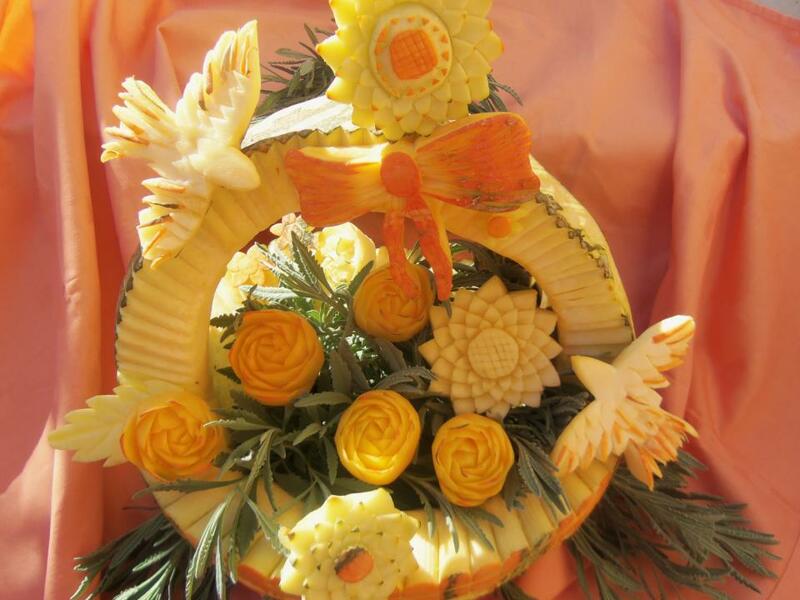 Q.: Have you ever tried yourself in a fruit and vegetable carving art? Simple food and drink garnishes? 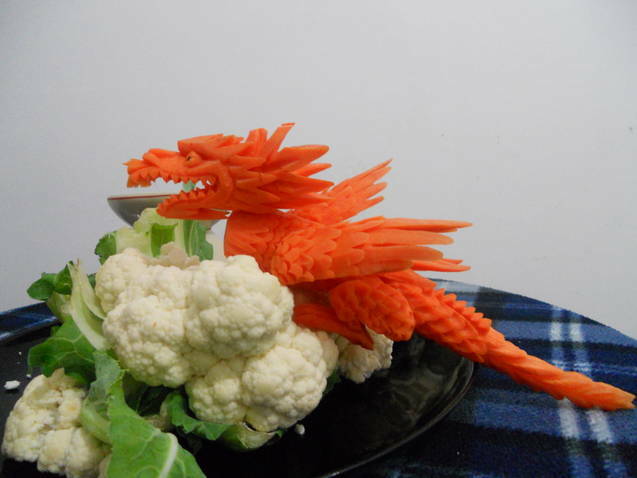 Fun with food? If yes can you share your favorite one? A.: I think the favourite food garnish I have ever done was impaling pieces of vegetarian hot dog sausages with pieces of spaghetti and then cooking them together for my kids. They love them! ALso I arrange their food on their plate into faces sometimes to help them find fun in their food. I used to like peeling oranges into faces/shapes. Автор: Unknown на Thursday, October 25, 2012 , Ссылки на это сообщение , 30 коммент. 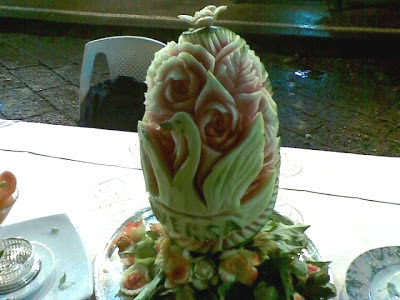 A pair of doves sit on the wedding watermelon. The bird's material is daikon. Carved with a thai knife. 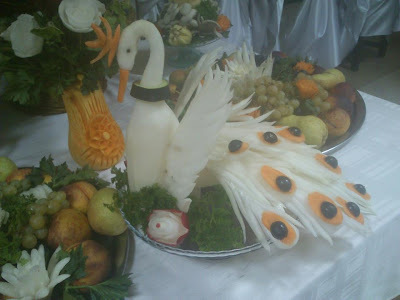 I use the Soap Carving Book for birds carving ideas. Автор: Unknown на Tuesday, October 23, 2012 , Ссылки на это сообщение , 3 коммент. Watermelon carving arrangement made for the fall themed wedding reception. 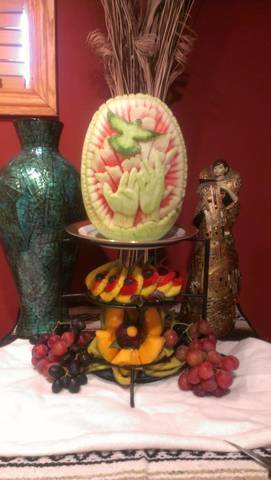 The watermelon with the fruit tray was displayed on the head table. 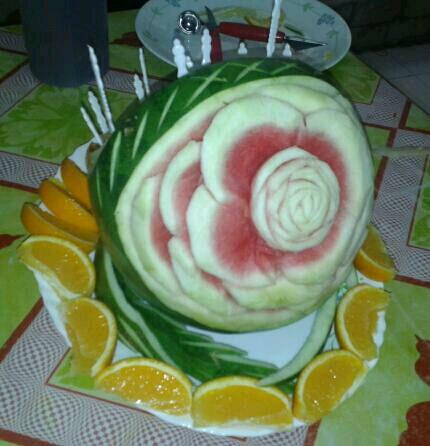 There are vegetable flowers on the top of the watermelon. Автор: Unknown на Monday, October 22, 2012 , Ссылки на это сообщение , 3 коммент. Pumpkin tree with the funny inhabitants was made for kids to kindergarten's fall event. I attached the 'Owl on the Moon' idea to the Pumpkin Tree. The main material for the display is pumpkin. I couldn't stop myself and made a Happy Harvest display as a bonus using the rest of pumpkins. 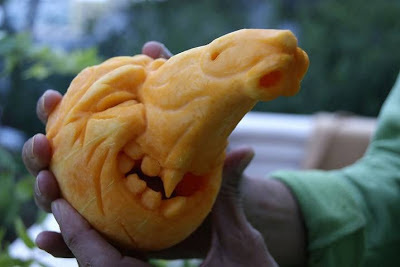 If you have a photo with your pumpkin craft feel free to submit it to the Fall Carving Contest 2012. Up to October 24 send your photo to my e-mail selen15367@yahoo.com and win the online poll. The top 3 winners will be given with lovely prizes. There are also some extra awards form Temple of Thai! Don't miss it! Автор: Unknown на Friday, October 19, 2012 , Ссылки на это сообщение , 3 коммент. 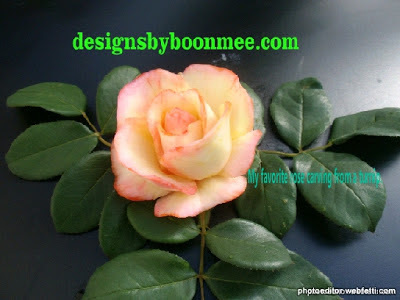 I want to share some pictures from my class on making a flower bouquet. There are works of my students and one of mine on the photo. At the class we carved flowers out of chinese cabbage, daikon, zuccini, cucumber and carrot. 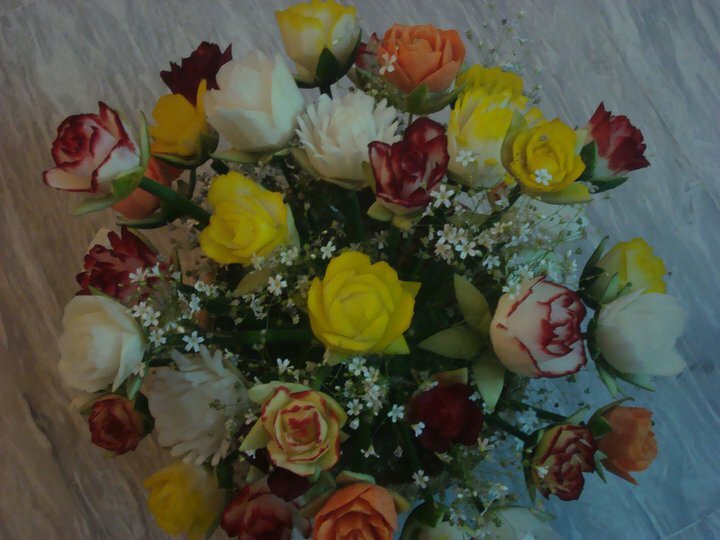 The flowers are not complicated. You can find them in the books and DVD's teaching basic skills. But I am not sure if all the books teach how to arrange the carving centerpieces in a nice bouquet. I love the photo because it shows the variety of arrangements in spite of using the same flowers made with the same tools. Share your carving work and win a special prize from GarnishFood Blog. Check out the details! Автор: Unknown на Monday, October 15, 2012 , Ссылки на это сообщение , 3 коммент. 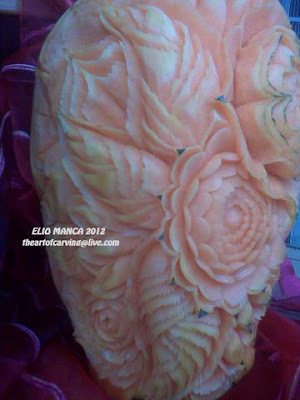 On September 30, 2012 my Carving Studio participated in the 'Crazy Hand-Made' exhibition. 'Crazy Hand-Made' is a name of crafter's community in my hometown. Every exhibition I show new displays never made before. When an idea or an image comes to my mind I write them into my A4 notebook. Some of them I use for my work, others have to be tested before. An exhibition is a perfect occasion to try new things out. I invited my students again to make carving displays. I asked them to not take the exhibition seriosly and let them play with materials. I believe that even basic skills can amaze. See what we made! Lemons and daikon roses, playing with colors. Work of mine. Beet roses arranged in the metal vase. Simple things look great when you add interesting details. Work of mine. 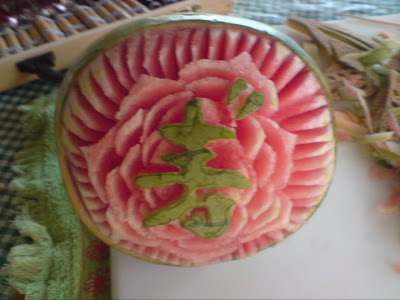 Melon and fantasy flowers on the holder made of Sakhalin bamboo. Ice rock out of daikon and penguin finger food. 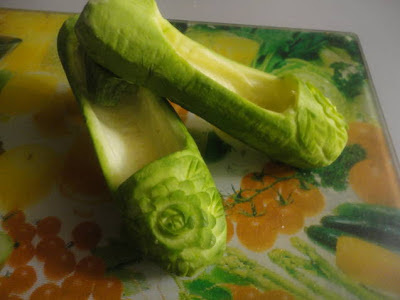 New look of the popular food idea. Marrow squash house. Made by Natalie. Visitors took photographs and asked the recipe of the penguins :) The favorite displays were the Ice Rock, the Marrow House and the Owl on the Moon. 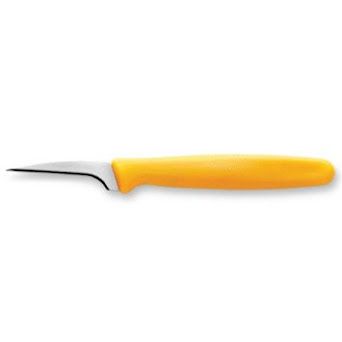 I think this is becouse they are simple and reqired a little of carving experience to do. 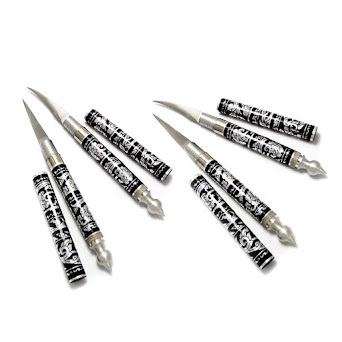 I had 'Triangle' tools and carving books for sale. And, of course, a short free class was given. Take a look or take a try! Just to remind that The Fall Carving Contest 2012 is on its first stage. 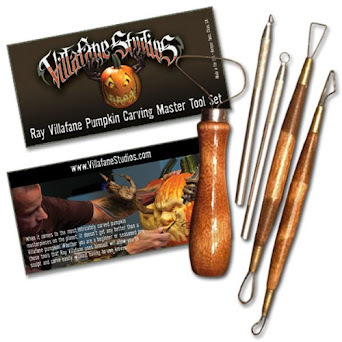 Submit your carving work up to September 24 and take a chance to win a lovely prize! Feel free in using materials and creating displays. Never mind if you are just a begginer or non-experienced. I have a surprise for you! Автор: Unknown на Saturday, October 13, 2012 , Ссылки на это сообщение , 3 коммент. Hi, I am Elena, also known as Selena Ze Arteest. 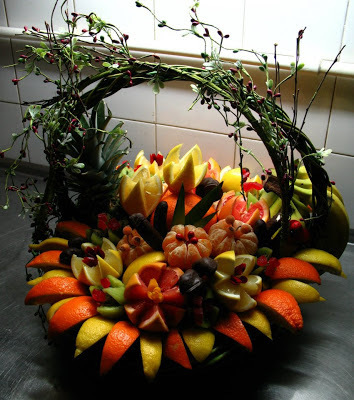 I am a designer, fruit carving artist and owner of Caving Studio since 2007. 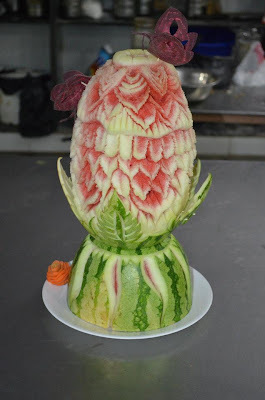 GarnishFood blog is about the art of Thai carving and edibe arrangements made of vegetables, fruits and sweets. 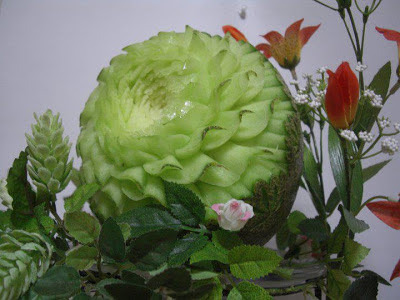 Recently I am keen on Ikebana art and phytodesign.